Maintaining healthy blood lipid levels is important for protecting your heart health. Lipids are essentially fats; substances like cholesterol are fats, for example. Too much cholesterol in the blood, known as LDL (bad) cholesterol, is associated with heart disease. 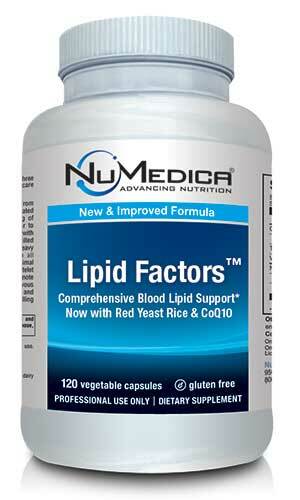 Many people turn to natural supplements like NuMedica Lipid Factors to help them support health blood lipid levels. This product is also formulated to provide support for you liver as it works to detox your body from toxins and unwanted chemicals. 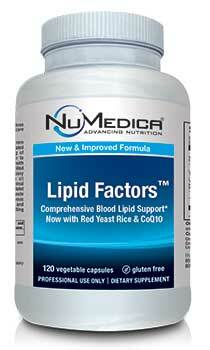 NuMedica is a trusted leader of the nutritional supplement industry. The company continues to lead the way in this field with its range of natural and nutritional supplements known for their safety and effectiveness. NuMedica's research continues to pave the way for new products that support comprehensive health. Talk to your healthcare provider about how nutritional supplements can support your healthy lifestyle. Although the body requires some lipids to function normally, it can suffer when lipid levels become too high. High blood cholesterol levels can lead to fat deposits in our arteries. In time, these deposits can lead to heart disease and block the blood flow within the arteries. Heart disease is a leading cause of death in many Western cultures. While exercise and diet can help us maintain heart health, taking a supplement like NuMedica Blood Lipid Factors can also help us maintain healthy blood lipid levels. Directions: Take four capsules daily after a meal or as directed by your healthcare practitioner. Want to try it but no Statin drugs worked yet? Any goals accomplished with this Lipid Factors?